Lead, mercury, iron, copper, manganese, cadmium, arsenic, nickel, aluminum, silver and beryllium are considered heavy metals. These metals have a variety of uses and in small quantity are harmless. In some cases, some of these metals are necessary for our bodies to function properly. When that quantity increases however, many problems arise. These heavy metals are very toxic if they are ingested in abnormal quantities. This amount does not have to be very great. Lead poisoning is probably the most common of the heavy metals because of its use in home products. Historically lead pipes were used to transport water into the house. Lead was also used in paint and gasoline. There are still old homes with lead based paint on their walls. Mercury is a yellowish liquid that is very toxic and is still used in thermometers. All of these metals are used in various industries today and a big question that remains is whether the metals make it into the water system and pollute our drinking water. This is very possible and in some cases a proven fact. 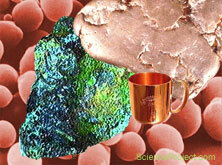 If these metals are ingested, they could create several serious illnesses. As a result, it is to no surprise that there is extensive research done to find the metals, and more importantly to detoxify our water. In this science project you will design and perform experiments to determine if yeast cells can be used to filter small amounts of heavy metals from water.